Now that summer has officially started, relaxation can begin right? Marcy and I are like polar opposites when it comes this (and it's why I adore her!). She takes things as they come, doesn't need a schedule (in fact loathes them), and surely does not need a set routine in the summer. I on the other hand relish in organization, consistency, and knowing what is around the bend (or at least thinking that I do!). She sounds a lot cooler, right?! So now that summer break is upon us, I told her that our household would be instituting "themes" for each week. She probably laughed on the inside, but was kind enough to smile on the outside. I tried to think of themes that were educational, character building, and ones that I could use at home and in my classroom. This week's theme is RESPONSIBILITY. Having a two and a half year old at home will cause you to laugh a lot, and also want to pull your hair out. With long summer days ahead, and a new baby at home, I thought it was important to start out with this theme. There is a lot of redirecting going on around here, and at times I feel as if I only say, "No" or "Don't do that". However, there are a lot of great things that our toddler does as well. 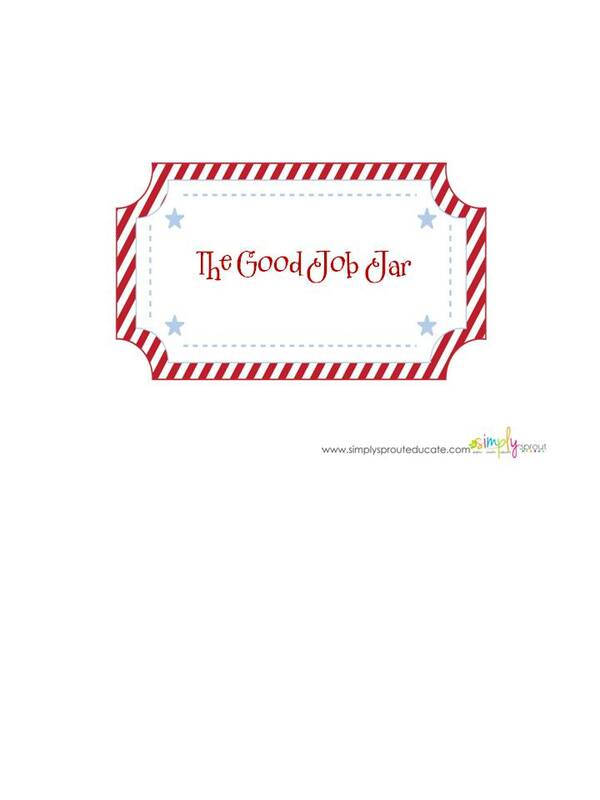 So we made a Good Job Jar. Each time our son does something that warrants significant praise, he gets a pom pom put in his jar. We have had many discussions about good decisions and responsible choices. 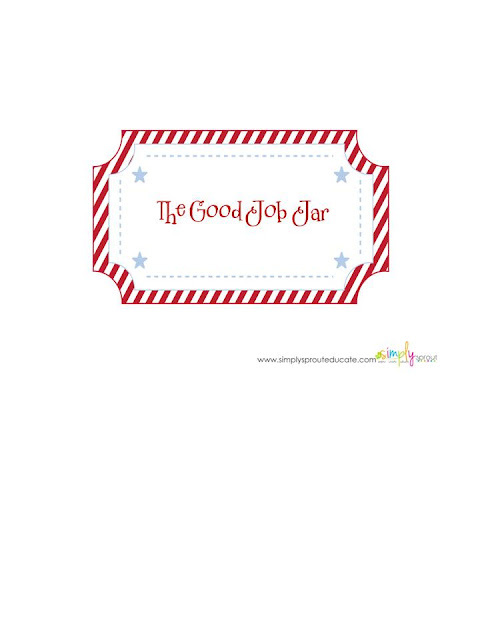 We have the jar out for display, so that he is reminded that he does great things throughout his days. 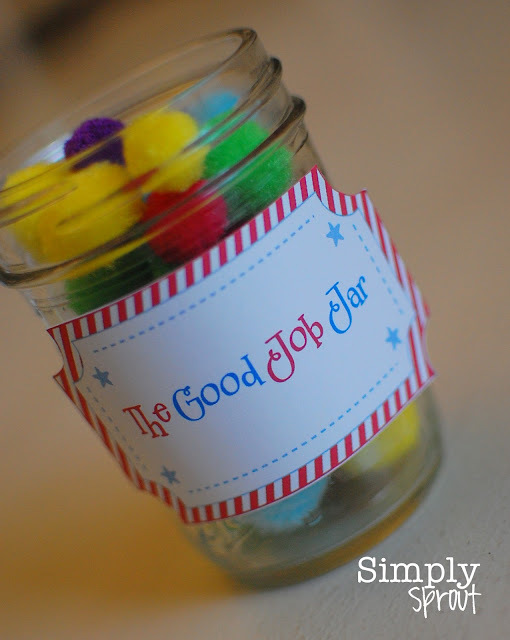 When he fills his jar we will celebrate! This is probably against a thousand and one child psychologists' recommendations, but it seems to really motivate one little boy. Teachers have used this concept for years in their classrooms, and praise is a powerful tool. I love when my students (and child) receive compliments from others. It makes us teachers (and mamas) beam with pride! Right click on the tag below to copy and paste it into a Word document. Then you can adjust the size to fit the jar of your choosing.